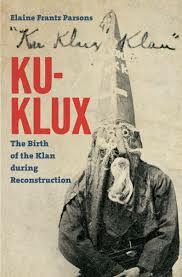 Ku Klux Klan Research Papers look at the beginning stages of this organization and the prosperous years of this organization. Ku Klux Klan term paper due and don’t know how to start it? How about like this? M. Lutholz characterizes the Klan as “…a recurring nightmare in American history…”. The Ku Klux Klan (KKK) first began as a group of Confederate veterans lead by General Nathan Bedford Forest. In its beginning stages, the organization was confined to one area, the South. This organization meted out terror to carpet-baggers, blacks, and, in Lutholz’ words, “ …to anyone, black or white, who was foolish enough to stand in its way…” When the Klan first began they were very successful - so successful that the Federal government felt the necessity to intervene; Bedford Forrest was forced to disband the Klan in 1869. This disbandment did not actually occur until 1871 when President Grant sent troops into South Carolina, suspended habeas corpus, and had his Justice Department initiate prosecutions under the Ku Klux Klan Act of 1871. The Klan went underground and became relatively quiet for over a quarter of a century. But it should be noted that the aims of the Klan, the interference in the Reconstruction of the South and the denial of voting rights to blacks, quickly became an accomplished fact. The Klan came out of hiding again when World War II began. The spirit of America was that the nation should forbid people of other nationalities from entering or living within our nation’s borders. Popular movies of the day illustrated that the Klan was to be supported by the American people, not put down. For example the movie “Birth of a Nation” was a historical film that depicted the Klan in a sympathetic way and is said to be one of the factors that caused the rise of the Klan in the 20th Century. These principles provided direction and a platform in which the Klan could build membership and declare themselves a legitimate organization. Some estimates of membership included numbers somewhere around nearly four million in the early part of the 20th Century. Paper Masters writes custom research papers on Ku Klux Klan and look at the beginning stages of this organization and the prosperous years of this organization.